Longing To Get Maximum Returns On Each Single Penny You Invest? Try Google Adwords! Home > Blog > Blog > Longing To Get Maximum Returns On Each Single Penny You Invest? Try Google Adwords! So, if your business is potentially visible on Google, brand awareness for it gets spontaneously generated, the bare minimum that can happen. 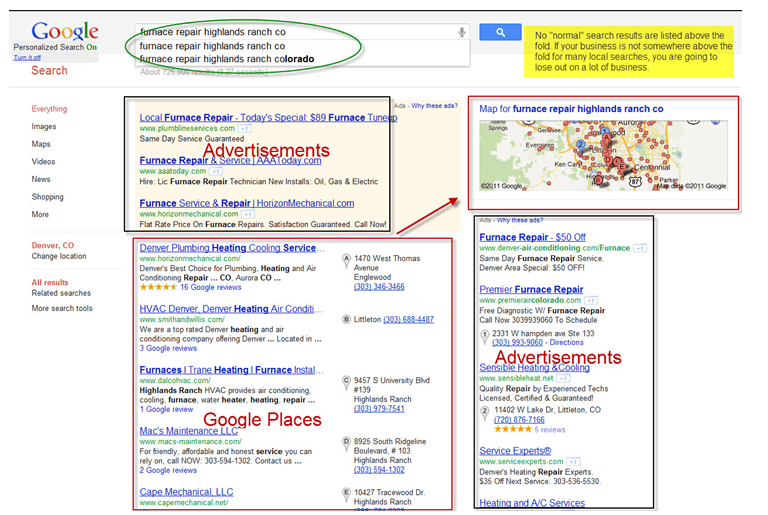 The most remarkable point is that Google proffers both organic and inorganic way to get visible. The one that we know as the organic or the natural process is called search engine optimization while the other one that’s inorganic is Adwords & PPC advertising, which was launched by the Google on the 23rd of October, 2000. Google Adwords is an online advertising platform that places advertising copy at the top, bottom or at the side the list of search results Google displays for a particular search query. AdWords is the Google’s main source of revenue. Google’s earned total advertising revenue in the year 2012 was $42.5 billion. 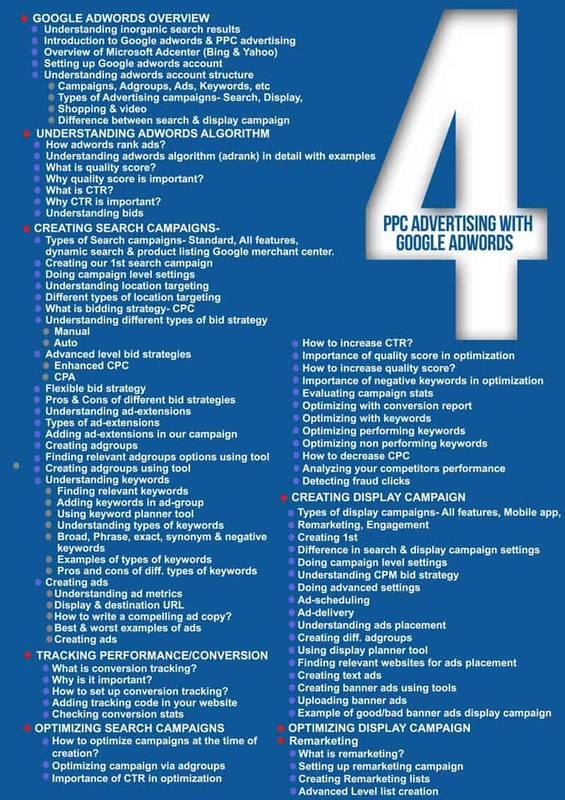 The most commonly used words in Google AdWords are PPC (Pay-Per-Click) and CPM (Cost-per-thousand-impressions or Cost per Mile) advertising, site-targeted advertising for text, banner, and rich-media ads, and remarketing. The AdWords program includes local, national, and international distribution. Google’s text advertisements are short, consisting of one headline of 25 characters, two additional text lines of 35 characters each, and a display URL of 35 characters. When a person comes at Google’s page and types in anything in its search bar then Google shows some results relevant to the query. The page that gets displayed is known as Google Search Engine Result Page and the word or words written in Google bar to get some related details is known as keyword. Keyword plays a very important role. Suppose you decided to go out for a holiday say Delhi and you are looking for a hotel to stay. Now depending on your budget and requirement you will type the so-called keywords in the search bar on Google such as best hotels in Delhi, cheap hotels in Delhi, expensive hotels in Delhi, hotels in Delhi near railway station or airport etc and Google will show you results. This is one thing that Google do, however there are a lot of other thing that the search engine does. Let’s suppose you have a hotel say in Delhi near railway station and you want more and more people mainly the travelers coming to Delhi to know about it. Being a part of this digital era, you will certainly think about getting your hotel information displayed on the all promising platform such as Google, where your target customers come very frequently. So, you would certainly think about placing an advertisement on Google ranking pages in order to make your potential buyers (those looking for hotels in Delhi) see your advertisement and inquire about your hotel by clicking your link and coming to your webpage. If one finds everything good can book online your hotel room! This way a user can get a room and you get a business. Correct! It will be like win-win situation for both the parties. Given below picture can illustrate you well where user writes the keywords and how the page looks like and where inorganic i.e. paid advertisement appears. A user can use several keywords to look for a hotel in Delhi and how would you get to know that and how your Ads will pop up? It means before making an advertisement you have to work hard on all the probable keywords that are genuine for your business. Suppose you followed each step correctly but you choose wrong keywords. How would you expect your ads to get triggered and so your money will run down the drain without giving you any result. Hence, it is very important to choose the right keywords for your ads so get the rich dividends. Choosing the keyword however is not an easy task. Of course, Google presents you a tool known as Google keyword planner which is for free. Moreover, there are various other but paid software that help you to have better control over your keywords. Searches containing the exact keywords term or a close variation of that exact keyword term, in that order! Searches containing the keyword phrase, and close variations, in that order! Searches including misspellings, synonyms, related searches and the relevant variations of the keyword! The thing that’s important for your Google Adwords successful campaigning where in you get the maximum ROI is the Adcopy. Adcopy is a term that refers to the main text of a clickable advertisement. Generally the second and third lines are the Adcopy which is displayed on a search engine results page. Google looks at your adcopy and the link of the landing page. After all user satisfaction is important and if you have followed the format then it is placed for advertisement and of course they are paid advertisement i.e. charges as per PPC or CPM. Appearing on the first page of Google result page is important to get the best result of your ads campaign which is easily possible if you are using a good quality AdWords campaign that can be set up usually within 72 hours (dependent upon size). Now a day digital marketing has become so popular that more and more people are learning so you can outsource your work to any good certified professionals who can work for you efficiently. Customers are everywhere and you can diversify the marketing channels so you can appear consistent regardless of where your consumers go. This will help you to go the extra mile to get your consumer and this will establish you as a good market leader. When you do PPC ads it is likely that your reach increases because you are appearing in organic as well as inorganic results. It means you are appearing twice in Google Search Page and this will increase your branding. PPC campaign needs a landing page and here you can make changes if you find that the response is not as per your expectation. It gives you a freedom to go for hit and trial process which is known as A/B testing. It really helps you to boost your marketing strategy. In this present time where your product can be used or consumed globally it is important to think and plan strategy globally which is extremely easy to achieve. AdWords campaign can reach local to global just at a few clicks. Further you can use that country’s native language to get extra benefits. Here we use multiple languages: English, French, German, Italian, Spanish, Dutch and Polish. Now a day consumers are available online and using different devices and PPC allows you to customize messaging and strategy as per the consumer devices. Business means competition and the best thing about PPC is that you can see what your competitors are doing and how much web traffic you share. Such information helps you learn from your competitors and you can do better. Now a day Google Certified AdWords experts are coming from different backgrounds so with their experience they can give you valuable suggestions on landing page optimization, website content etc. You have the best option with you that you will pay only when someone clicks on your ads. If your ads are appearing before the potential buyers and they are not clicking on your ad’s copy then you don’t need to pay a single penny. It means you only get filtered buyers and so get maximum returns on your investment. What DSIM covers in PPC Advertising with Google Adwords? At DSIM, you get to cover in and out of PPC Advertising with Google Adwords starting from its introduction to how to conduct it efficiently, which includes campaign creation, tracking, optimization and much more. This is just a gist of what you will learn @DSIM, for the detailed course curriculum, you can always download it on DSIM’s website or simply click here!